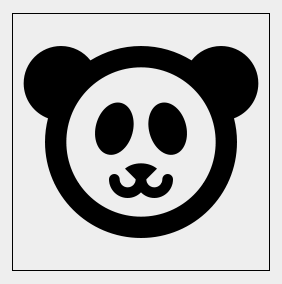 Lets create a simple canvas element and add an image of a panda (we all like pandas, right?). In the following steps we will convert the canvas image to base64 by using .toDataURL() which is part of the Canvas API. HTMLCanvasElement.toDataURL() Returns a data-URL containing a representation of the image in the format specified by the type parameter. The function below will take the base64 string and convert it to a Blob/Binary String that will be sent to the Facebook and Twitter APIs. This function will be referenced later in the code. Blob(blobParts[, options]) Returns a newly created Blob object whose content consists of the concatenation of the array of values given in parameter. Posting the image to Facebook will require creating a Facebook app which you will also need to request the ‘publish_actions’ permission when making the app live. Now we create a ‘Post to Facebook’ button and link a click handler for the logic. Below you can see that we grab the base64 encoding of the canvas image that has been returned in the format of a .png image. We then try to convert the base64 string into a Blob. Using the Facebook JS SDK, after the user has logged in and given the app permission, the ‘postImageToFacebook’ function is called and passed several arguments. Posting to the blob to facebook requires the use of FormData. The function first uploads the picture to facebook without creating a story on the user’s timeline. Then it retrieves the saved image and creates a story on the user’s timeline using the fields provided. NOTE: The ‘message’ field must be left blank unless you provide the user a way to add one. Posting the image to twitter will also require you to create a Twitter App. Twitter still uses OAuth 1.0, so you will either need to use server-side code or a service such as ouath.io. Unless requested I’ll skip the authentication process here for TwitterOAuth which I’m using. The functions used below handle the popup that communicates with server-side code Credits to https://github.com/nobuf/jQuery-OAuth-Popup. Posting to Twitter is similar to Facebook in the case that you use FormData, but this is sent to your server-side handler or service instead. You can send the image as a Blob but this is not necessary. The variable window.twit contains authentication data sent from the popup window back to the parent webpage/tab. Here is the snippet of server-side code that handles the FormData to be sent to twitter using TwitterOAuth. The credentials are verified then the base64 image is uploaded to Twitter’s API ‘upload/image’ endpoint. The object returned is then added to the list of parameters for posting a status. Great tutorial! How would I modify the FB.api payload to allow the user to add a custom message before posting? Thanks! I’m glad it helped you out! The best way to approach customizing the share would be to give the user some UI other than the button to work with. Using the graph API, you can allow the user to share to a specific page, event, or group. For example, a modal would be great here with input fields to add additional information such as the a custom message or adjusting privacy settings. Hi Jerez, thanks for the advice. Cool, I’ll need to give this a try! Hi Jorge, I didn’t see the twitter login button in your demo. Were you able to figure it out? This has been a fantastic tutorial & I’m almost there. I’m absolutely stuck on the Twitter implementation. I get the popup window & twitter asks to authorize, but it doesn’t redirect me to the page like your example does (& no photo posts). Instead I get a Twitter page in the popup that gives me a pin number & tells me to go back to app to “complete the authorization process”. What do you set your OAUTH_CALLBACK to in the twitter.php/share-on-twitter.php (using your version from github) and what is set on the Twitter app itself? I’ve set it to “oob” per the Twitter docs, which gives the pin response described above. But if I set everything to my apps’ URL, it brings the app up inside the pop up & does not post the photo. The secret isn’t exposed using my method because posting to Facebook is all handled within the client browser thanks to Oauth2. Unlike Twitter which is Oauth1 and needs an intermediate server to communicate with. These “canvas.toDataUr” posts work great – big thanks for that code fragment. But stil I have problems with fact that it’s impossible to close that FB.login modal popup. Is there solution ? At the moment i read that i’m not the only one. Is there other ways to authorize FB not using that popup? Thanks Janis. Yes i agree the login modal can be annoying to figure out. The main reason it does not close is because there is usually an issue with the callback url or other Client OAuth Settings in your Facebook app settings. However, you could use the PHP SDK as a login flow instead of this. Hi thank for that tutorial. I m almost done, but i got an issue. Hey, Thanks! I’m guessing this is when your are uploading the canvas image to facebook photos. What formData are you sending in this call? I just used this: copied and past from this this tutorial. Okay. So I see that you are getting a 403 error, correct? In your facebook app settings, did you request the ‘publish_actions’ permission when you made the app live? Also in the network tab of your browser’s developer tools you should be able to see the exact request that returned the 403 and also a possible explanation why. i didn t request for ‘publish_action’ i will do it right now. I tested this share button with my own account (admin account) and it doesn’t work. But i created a tester account and it work fine. I saw the shared post on the tester account wall. Glad you got it working. Your admin account may have to grant your app publish_actions permissions for it to work since it had already asked for permissions before and might not ask again. I made my request to get “Publish_Action” facebook said i didn t need that because i use just a share button, so they don t give me the Auth. Is there a way to doing that without using API Graph ? I’m using your tutorial to post image created in canvas to Facebook and Twitter. For Facebook, it works great but I’m facing problem in uploading base64 image to Twitter whereas posting text on Twitter works good. It will be appreciable if you can me to sort out this issue. Hey Revneet, have you checked that the canvas has been converted to a dataURL and that it is being sent along with the ajax request to ‘/auth/twitter.php’? Hi Jerez, Thanks for the reply. Yes, canvas has been converted to a dataURL and it is being sent along with ajax request to /auth/share-on-twitter.php after getting authorization from /auth/twitter.php opened in a new window. -> On click “Share Image on Twitter” button, /auth/twitter.php opens into a new window that asks for login to twitter to get authorized. -> After getting authorization, response with “oauth_token” and other details are send to page. -> After getting response, ajax request with form data (that includes status, image in base64 and “oauth_token” & “oauth_token_secret”) sends to /auth/share-on-twitter.php. -> This method is located on /vendor/abraham/twitteroauth/src/TwitterOAuth.php. -> After reaching to upload method, it calls to new function called “uploadMediaNotChunked”. -> After this, private function “http” is called. -> Then, “oAuthRequest” function is called. after sending request through CURL. Please let me know if you able find out the issue. I like you tutorial a lot. I’m trying it out myself and stuck though. I have the facebook app set up and the image sharing code from my app is all in place. I am successful at putting the image in my facebook profile without creating the story. It’s just when it’s time to create the story that it doesn’t work. Do I require publish_actions to just post to my own feed? Update: It works now. Fb can’t scrape a page from localhost in time to generate the image share. As soon as I uploaded to a dev server, it worked fine. Thanks again for this great tutorial, Jerez!! Hi Seth, Glad you liked the tutorial! Sorry I didn’t reply sooner, but I’m glad you git it to work. Cheers! Hi, nice article. I have a question, can this upload procedure work from an intranet site ? Hi Haris, thank you. I believe it should be fine though, that depends on the outbound restrictions set for the intranet. I would suggest testing it first if that is possible for you. Can I use this with HTML2Canvas? 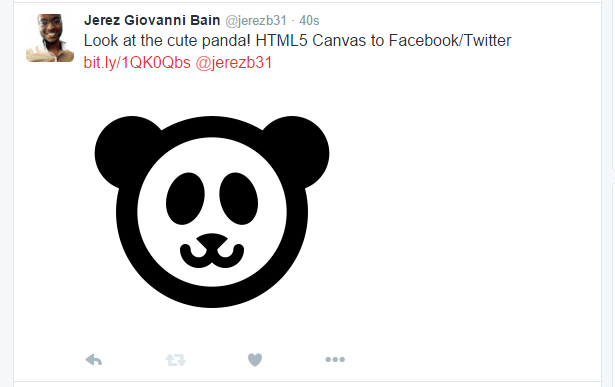 They should work well together, you just skip the first step of creating the canvas image because HTML2Canvas does it for you. Thanks for the info, Max! I had planned to update the tutorial soon to keep it relevant. The Facebook option no longer works. Can you update the code? Hi, nice work! I tried the demo page and to click “post to facebook” but nothing happen. However, the twitter function is working. Wondering if the code for sharing to facebook is working fine? Hi, thanks! I just tested it and it successfully posted to my facebook wall. In the developer console is it giving any errors? Looks like FB sdk can’t define blob? I changed the version to 2.9 for fb.init in js. Not sure if I miss out something? I see the “picture” and “object_attachment” fields have been deprecated since 17 July for all API versions. Any way to use this method still? Hi There, for the Twitter callback to work, what should the parameter be in the Callback URL settings in Twitter? Thanks! Think I found the solution via your reply to user Erik Baker below. The callback URL should be mydomain.com/auth/twitter-finish.php. Works like a charm! Thanks for the great example. Not sure why, but when I make the image upload to my album, it works fine. When I go to post it, it posts some other scraped image. Doesn’t post the image uploaded. Not sure if this is because of updated fb policies, or ? ? I have to use this code for twitter post share. I got an error like window.twit is undefined after authenticate the user. Also, got the issue with popup window, actually popup window never closed automatically after authentication. Please suggest me how I resolve that issue. Hi Shruti, I’ll try me best! Is the issue happening after you try sharing to twitter? Hey Jerez great stuff man. Can you point me in the right direction to solve this error which occurs when I click the ‘#shareFb’ button: Uncaught DOMException: Failed to execute ‘toDataURL’ on ‘HTMLCanvasElement’: Tainted canvases may not be exported. Much appreciated Jerez, that produced the following: Access to image….from origin ‘null’ has been blocked by CORS policy: Invalid response. Origin ‘null’ is therefore not allowed access. at Object.callback ((index):177) .Kindly advice me. I’ll test it out and let you know. Facebook required some changes possibly due to the whole privacy issue at the moment, so the app was set in development mode. Let me know if it is working now. Hey Jerez, I was trying to use the Facebook share demo as well but it doesn’t seem to work still. Do you have any suggestions? Hey Gator, are you getting the same error that Emi got? Hey Gator, I made some updates to the code, can you try it again? I get a modal popup now that says “connected, posting to Facebook” but it still gives a 403 error in the console. ahhh i see now. When you were testing the app did you allow the requested permissions? The issue is that it does not have permission to upload the canvas image to your profile. 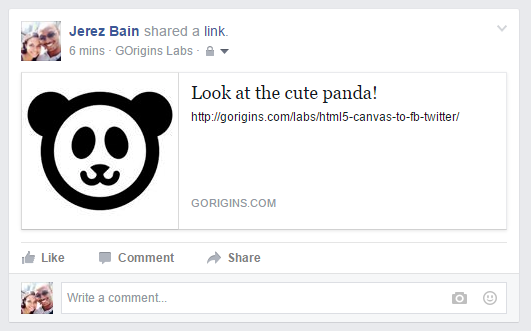 Great tutorial, it worked until about a month ago, but now facebook removed publish_actions so there isn’t a way to share canvas image on fb anymore. Tried using share_open_graph but that doesn’t accept base64 encoded images. I’m very new in twitter aps so I don’t know what I must provide as callback URL. Is your “share-on-twitter.php” ? Because when I try it, I have php error because of authentification. “Facebook has detected GOrigins Labs isn’t using a secure connection to transfer information.